Certainly, 'politics' has been the buzzword for what should be completely accepted as simple coincidence. Some amazing things have happened over the last couple of years. A transparency bill that had 100% support in both houses was vetoed; likely because of its implication of deals going down with Canada on the international trade crossing. The only other way besides political pressure to stop an override of the veto would literally be a gun to the head of our legislative leaders; and we know that didn’t happen did it? Somehow, his legislative lapdogs (Bolger and Richardville) still pushed through (against caucus desire) the medicaid expansion which has an even more threatening effect on Michigan’s treasury. Again, seeing no open coercion, it seems he was able to get his way quite easily. Now in lame duck, all bets are off for a couple of moves that are sure to keep the crony friends of Rick Snyder rolling in dough. 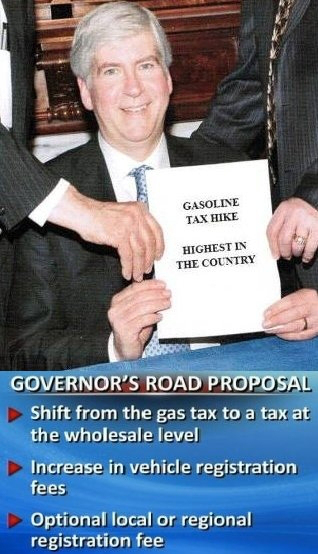 Randy Richardville has moved forward on a monster GAS-TAX increase that will stuff the wallets of a lot of contractors, put steam in train engines, and make all the bike riders ‘complete’ly happy. I don’t even need to drop the links on those; you know we’ve talked about it before. But what pray tell might be the payoff for Richardville? What might he see for his part in sticking it to the taxpayer of Michigan? Well certainly he has been shtooping us for the love of shtooping, right? But I would wager that if the interviews for the following happened last Wednesday as they were supposed to, I’ll bet you can guess what happens next. Of course.. I could be proven wrong. The clock is a ticking, and there are so many more Michiganites waiting to be screwed. Novi DC is an arm of the 52nd DC. It is an interesting set-up that Oakland County has in that the 52nd DC has three arms and by Supreme Court order is actually a secret circuit court. Does this mean OC has its own FAISA Court? This multi-jurisdictional court involves all four corners of the county and makes it so, so convenient for the issuing of search warrants. Issuing of search Warrants in Oakland County has a long history of abuse. Anyone living in the district, i.e., Oakland County is therefore qualified to sit on the bench. It disturbs me how greatly the courts are money generating operations. Governor Snyder is quite malleable on issues which don't attract his interest, or which he regards as 'peripheral' to his agenda. Snyder's actions and directives on these issues actually come from aggressive aides, notably Sally Durfee, his Deputy Director of Legislative Affairs. They set the agenda, conduct the 'negotiations', and report back to the Governor. On issues Governor Snyder considers core elements of his agenda, he holds any and all opposition in contempt. Doesn't give the opposition any hearing and imputes base motives to their resistance to his enlightened policy vision. Governor Snyder may go through the motions of negotiating important issues, but he never seriously accepts any alterations to his grand plans. Typical American corporate mandarin. Why the American economy is a pale shadow of its former vitality. First, the above commentary is spot on and (thankfully) welcome. :..The State of Michigan has informed Data Center project bidders within the last few days that they are formally withdrawing the Request For Proposal (RFP) for the Data Center.. However, we have received some additional information regarding future State intentions, secondly we have begun investigating the potential to move forward with the GLTP project independent of the State..while the State has indicated it does not currently plan to pursue a new base Data Center site in the immediate future, they have indicated a desire to move forward with a secondary disaster recovery site in the near term..."
Thanks for reminding us of the transparency bill. In any other time than the present apathetic atmosphere? A failure to act such as this on BOTH sides would have definitely 'mucked the barn out' in historic fashion during the following election cycle (we never had the leadership to prioritize/vocalize these history changing votes; see this one immediately BEFORE the election itself as our #1 example of failed leadership statewide: Senate Bill 1129; pension obligation bonds/"no vote of the people required").